Complimentary tastings and FREE shipping on any orders of 6+ bottles (excluding AK and HI). 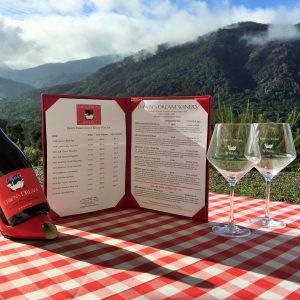 Please join us at the Dawn’s Dream Tasting Room in beautiful Carmel-by-the-Sea where we are surrounded by breathtaking scenery, fine wines, and delicious food. Whether you are out with a group of friends or your main squeeze, Dawn’s Dream is the perfect getaway spot for exuberant or intimate gatherings where everyone–even your dog–is welcome. Gourmet cheese plates are available for purchase to pair with your wine flights. In addition, all wines sampled are available for purchase by the glass. We encourage you to join our Wine Club to enjoy complimentary tastings, wine discounts, and great shipping rates on all of our wines! Dawn’s “dream” has always been to help create dreams for others by donating her product, money or time to support nonprofit organizations both locally and globally. Dawn’s passion for helping women and children equals her passion for making wine. Dawn has produced award-winning wines of exceptional quality and elegance while maintaining a business model that allows for the opportunity to give back.